Aside from the famous falls, one of the best reasons to visit Niagara is for the food. The region boasts a number of restaurants running the gamut from quaint cafe to five-star luxury. In addition, you’ll find most cuisines represented here, whether you’re in the mood for Thai or Mexican or anything in between. However, one of the most popular types of cuisine in the United States and Canada is the simple, comforting, delicious BBQ. 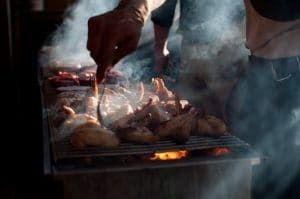 Made famous in the Midwestern and Southern portions of the United States, many would call BBQ an art as well as a style of cuisine, but we just call it delicious. 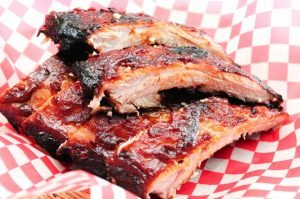 On your next visit to Niagara Falls be sure to try one of these BBQ restaurants for a truly savory experience. Hailed as Niagara’s original southern BBQ joint, Jeffro’s BBQ serves up classic Southern style BBQ dishes and all of the traditional and yummy sides to go with it. Brisket, pulled pork, chicken, and ribs grace the menu along with burgers, salads, and drool-worthy appetizers like the brisket poutine. On Tuesday evenings the locals descend upon Jeffro’s in their classic cars and a special menu is rolled out to celebrate. This is not only the best place to get BBQ in Niagara, but also a great way to get to know some of the people who call this area home. Just a short distance from Niagara Falls in Lewiston, New York is Brickyard Pub & BBQ. With all meats smoked on site for 14 hours over a blend of hickory and fruit woods, this BBQ is the real deal. They also offer an extensive beer and bourbon selection. Brickyard offers a delightfully big menu with a wide variety of smoked meat dishes, ribs, burgers, salads, and the side dishes you’d expect with good BBQ, such as coleslaw, beans, and mac and cheese. For those of drinking age in the United States you can even have a shot of bourbon as a side dish. Brickyard also sells their homemade rubs and sauces so you can take a bit of Niagara BBQ home with you. While not strictly a BBQ joint in the way the other two places on this list are, The Great Niagara BBQ Company still fits the bill and has served many, many happy customers. They offer the traditional dishes you’d expect from a good BBQ restaurant, including pulled pork, ribs, steak. Their menu also includes a fun appetizer called the Pulled Pork Sundae, which consists of delectable pork layered with mashed potatoes and baked beans, served up like an ice cream sundae. Unlike their counterparts, The Great Niagara BBQ Company offers a nice selection of hot dogs, including a “create your own dawg” option. Beans, pulled pork, cheeses, and sauces are all available add-ons that result in a one of a kind comfort food experience. When in Niagara Falls you’ll have more food choices than you might expect. However, do yourself a favor and visit one of these BBQ restaurants during your stay and get a true down-South experience.